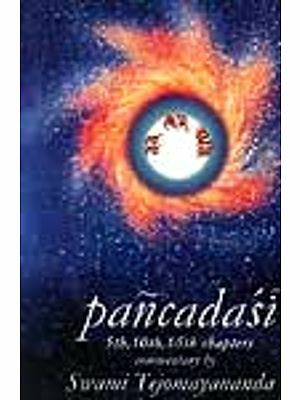 An Introduction to the Philosophy of Panchadasi is an offer of ours that contains the philosophical thoughts of Panchadasi, delivered at the Christo-Theosophical Society at Bloomsbury Square on the 27th October 1896. Swami Vivekananda was present on the occasion and was highly pleased at the crown success of his beloved spiritual brother. It is the maiden speech of Swami Abhedananda before the learned Western audience. Below are quoted certain authentic records of this lecture from the Life of Swami Vivekananda (Vol. II). "One of the events which satisfied the Swami (Vivekananda) immensely, was the success of the maiden speech of the Swami Abhedananda, whom he had designated to speak in his stead at a club in Bloomsbury Square, on October 27. The new monk gave an excellent address on the general character spiritual fervour and possibilities of making a good speaker. A description of this occasion, written by Mr. Eric Hammond, reads. 'Some disappointment awaited those that had gathered that afternoon. It was announced that Swamiji did not intend to speak, and Swami Abhedananda would address them instead. 'An overwhelming joy was noticeable in the Swami (Vivekananda) in his scholar's success. joy compelled him to put at least some of itself into words that rang with delight unalloyed. It was the joy of a spiritual father over the achievement of a well-beloved son, a successful and brilliant student. The Master was more than content to have effaced himself in order that his Brother's opportunity should be altogether unhindered. The whole impression had in it a glowing beauty quite indescribable. It was as though the Master thought and knew his thought to be true: 'Even if I perish on this plane, my message will be sounded through these dear lips and the world will hear it. He (Vivekananda) remarked that this was the first appearance of his dear Brother and pupil, as an English-speaking lecturer before an English audience, and he pulsated with pure pleasure at the applause that followed the remark. His selflessness throughout the episode burnt itself into one's deepest memory." The present book is an attempt to throw light upon the Vidyaranya or Vivarana school of Advaita Vedanta. It is the first lecture of Swami Abhedananda before the Western audience and as such the method employed in it is not marked by that peculiar novelty which characterises his later lectures and addresses. Yet the fact is to be noticed that the maiden speech also exhibits remarkable lucidity of expression and directness of appeal. 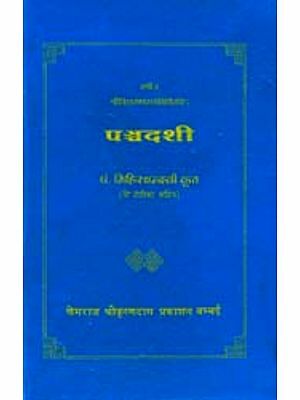 The philosophy of Panchadisi is a unique contribution to the domain of Indian thought. 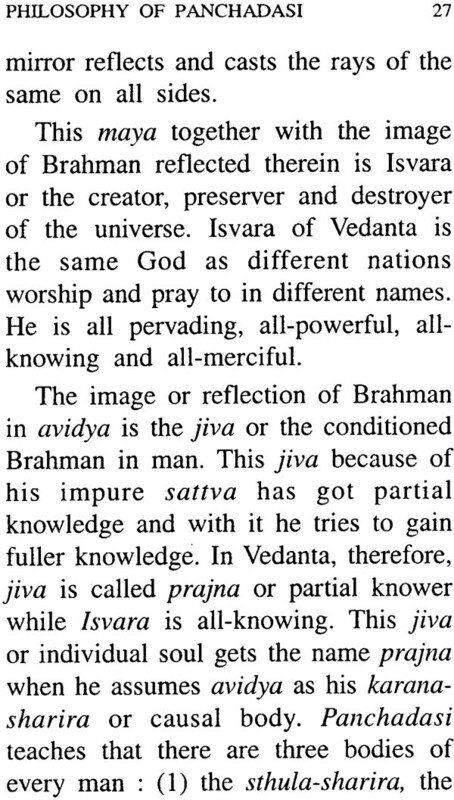 Swami Abhedananda's treatment of the subject is thoroughly subjective. 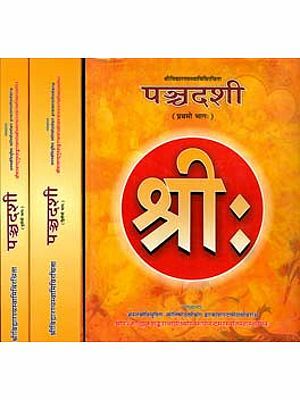 He has revealed here the central idea of Panchadasi philosophy faithfully and thereby has sought to awaken an interest of the reader in it. His method is essentially logical rather than historical. The historical background has been furnished for the sake of reader's convenience. 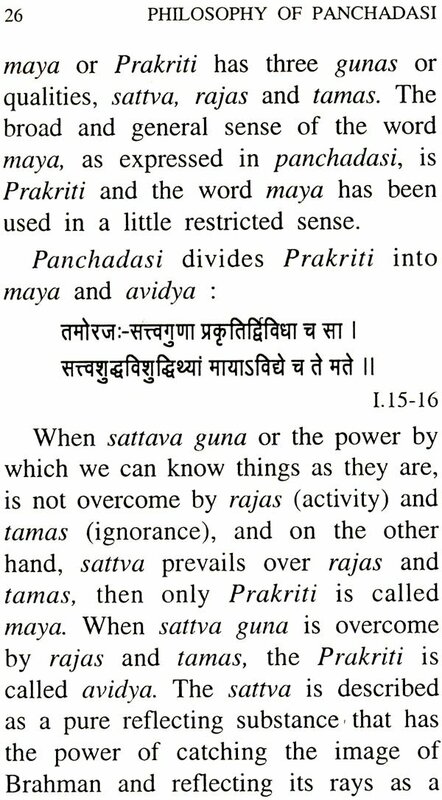 Preface,-What is Vedanta,-What is the Absolute in the Vedanta philosophy,-Three prasthanas, -Madhavacharya, -Brahman is beyond of everything empirical,-Words are relative, -Vachyartha and lakshartha, -What is maya, -The projection (sristi) of the words is due to maya, or Prakriti, -Three gunas, -Who is Isvara, -Who is jiva, -Three phases of the jiva, -What is antahkarana, five kinds of air, -What is superimposition, -Jiva as karta and bhokta, -What is sokapanodana, -What are the vasanas or desires, -The karmas, -How a jiva transcends the cycle of births and deaths, -What is Sadhana, -The Oneness with Brahman, -The right knowledge of Brahman, -Names and forms (Nama-rupa), -The necessity of vichara, -The Mahavakyas, -Tat and tam-Vichara, -What is vadha, -What is realization,-Meditation removes false knowledge,-The state of realization,-The cause of difference,-What is triputi,-The state of a jivanmukta.